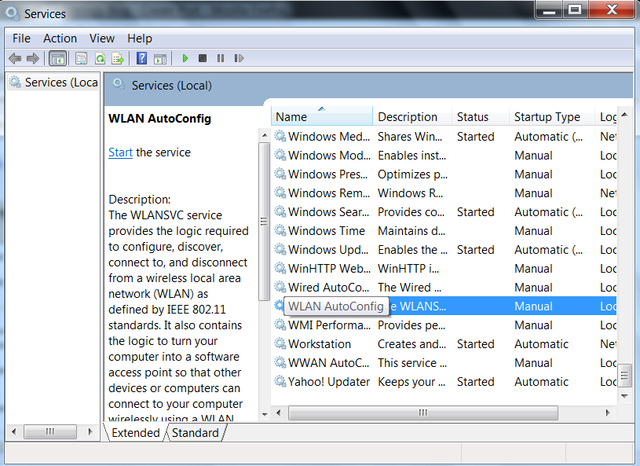 WLAN AutoConfig service ( WLANSVC ) helps Windows 8 and Windows 7 computers to discover a wireless network (802.11 standards) and connect to it. The same service is used in Vista instead of Wireless Zero Configuration(WZC) in Windows XP. In my personal experience by starting WLAN AutoConfig service instead of vendor wireless utilities on a computer, we can fix most of the wireless connectivity issues. 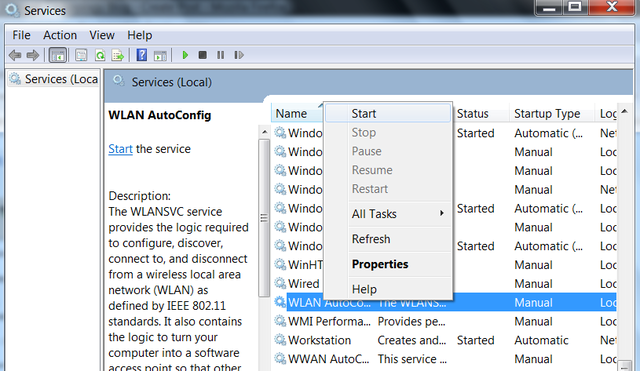 Windows 8, 7 and Vista computers use WLANSVC service to manage wireless networks and you can find it on services window under the display name WLAN Autoconfig. Sometimes WLAN AutoConfig does not start automatically by some strange reasons. So we may need to go to the service page and start this service manually. This tutorial tells how to run it on a computer in different ways. Once you start WLAN AutoConfig(WLANSVC Service) on your computer, it will start to discover available WiFi networks in your area. You have learned how to run wlansvc service from services window. There is one more method to do it apart from the GUI method. There is a DOS command to activate this service. However, we must have the administrative right to run this command because the DOS prompt must be run as administrator. Here we try the command prompt method to run it on Windows computer (Vista and above) for a particular wireless interface. To start the command prompt as administrator, visit the link below and follow the instructions there. This is the DOS Prompt command to start Wireless service on your Windows 8, 7 and Vista computer. set autoconfig enabled=yes interface="Name of Wireless Network Connection"
You must specify the name of the wireless connection as the interface. Here on the image, I typed the name of WiFi network corenetworkz. 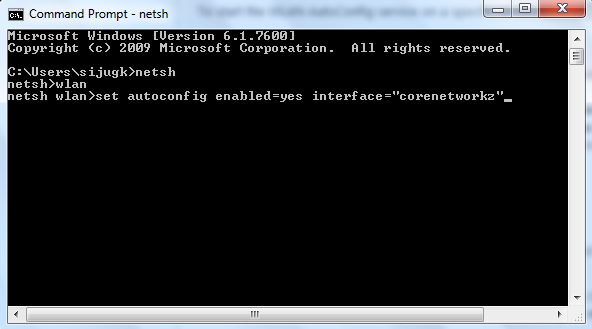 To read more about the use of command prompt command to activate WLAN AutoConfig, visit the link below. Here you will see how to remove or modify wireless filters on Windows 8 and 7 using DOS Prompt commands. Where is WZC On Windows 8, 7 & Vista Computers? After compiling this tutorial I have received inquiries from readers asking what happened to Wireless Zero Configuration (WZC) service in newer versions of Windows Operating Systems. We no longer see WZC on windows 8, Windows 7 and Vista computers because WZC is converted into WLAN AutoConfig service. So if you are looking for steps to find and start WZC (Wireless Zero Config) on Windows 7 and 8 computers, you must start WLAN AutoConfig instead. If you are not using Windows 7 or Windows 8 but running XP on your computer, visit the link below to learn how to find and start WZC. I'm using Toshiba L505 ES5018 with RTL8191SE WLAN, but can not see my adapter in network adapters. can u help me, please? It is a standard tutorial. I never knew I could start this service from Windows Command Prompt. Thank you very much. Are you getting any error message while trying to start the Wlan service ? 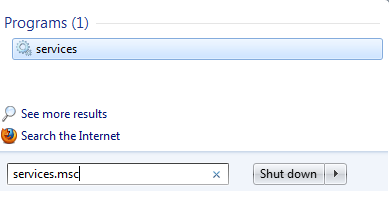 you should type the name of the wireless connection instead "Name of Wireless Network Connection"
I'm using Windows 8 and I was searching for service.msc in search, the result is showing no such thing why it so? Type services instead of service.msc on Windows 8 search. If it is not working try the command prompt method explained in the second part.